We got a pitch in our inbox from a company called Dujour Technology; they’ve developed an Android app dubbed ‘Currently Tech News’(direct Android Market link) that mines Twitter to aggregate breaking technology news from a select number of sources. The makers of the app acknowledge that the app looks pretty basic, but point out that there’s a sophisticated backend taking care of the data collection and analysis behind the scenes. The Currently server is constantly tracking Tweets mentioning certain tech news websites (of which TechCrunch is one of only a few). 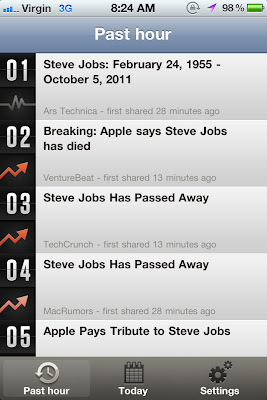 The Currently Tech News app then receives updates every 15 minutes and generates a pop-chart type list of news headlines. It’s like a Techmeme you can carry around in your pocket! Except, of course, you can carry around Techmeme in your pocket too (they have a decent mobile website). The benefit of the Currently app is that important headlines that are rising in the charts are delivered through notifications. You can turn off the alerts during your preferred ‘quiet time’ if you want, otherwise it’ll work 24/7. We heard about Currently from the founder of Scouta, a now defunct recommendation technology startup we’ve covered a lot in the past. Check it out if you’re a fellow tech news junkie.